Regular yoga in the workplace can bring overall well-being while bringing clarity, inspiration, innovation, and team building skills while improving and maintaining employee morale and positivity in the office. For our in-office corporate yoga clients we offer daily, weekly, bi-weekly, and monthly yoga classes in offices in and around the Charleston, SC area. We offer flexible pricing and all of our corporate yoga class teachers are 200 or 500 hour certified yoga teachers. Our classes feature breath control, mindfulness, and deep relaxation. The class pace is adjustable and can meet all experience and fitness levels. 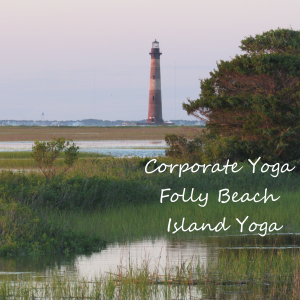 For those visiting the area for business we can offer a single beach yoga class, half day, full day, weekend, or full week packages on Folly Beach Island. Depending upon your choices we can also offer local dining options for breakfast, lunch, and dinner for all palates, including vegetarian and vegan / plant based diets. We can also assist with the coordination of lodging accommodations and other Charleston area events, attractions, and activities. Please see our retreat style corporate yoga page for more of our specialized corporate beach yoga retreat options.